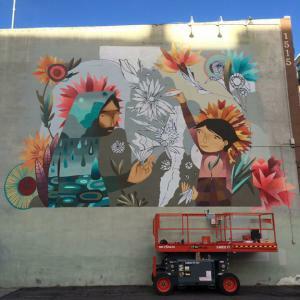 Photo courtesy of the Denver Art Museum: Denver muralists Jaime Molina and Pedro Barrios work to complete a new mural downtown. Scott Reiman, along with the Reiman Foundation are the founding sponsor of the Denver Art Museum’s Free for Kids program. To further support the program’s mission to provide all kids with access to the arts, Reiman and the Foundation are proud to welcome a new presenting sponsor, Bellco Credit Union. Bellco’s sponsorship will help provide enhanced cultural learning and engagement opportunities, arts education materials for youth visitors, and funding for community outreach. Free for Kids includes free general admission to all visitors under age 18, including school tours and other youth group visits. The museum has seen an increase in school visits by more than 50 percent since the program began in March 2015. The announcement is marked by the creation of an outdoor wall mural by Denver muralists Pedro Barrios and Jaime Molina. The mural is located downtown outside the 1515 Restaurant at the corner of Market and 15th streets. Local families joined the artists at the Museum on Tuesday, Nov. 22 to create their own mural designs in honor of the new mural and new collaboration. Learn more about the Denver Art Museum’s Free for Kids program.